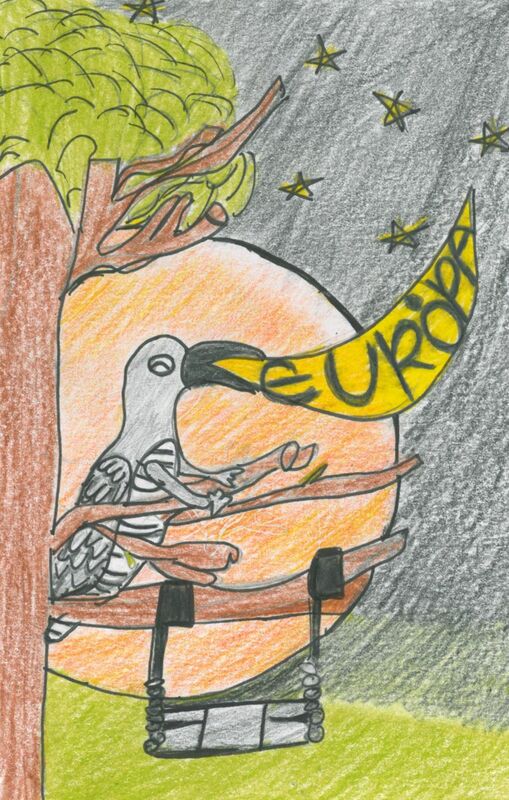 Kovács & Kováts: The EU speaking with one voice? In our experience, public opinion does not distinguish between the European Parliament, Council, Commission, etc. The images of the institutions are not distinct of each other and citizens (rightly) look at the EU as one "organisation". Outside of Brussels, not much attention is paid to institutional infighting, or "internal coordination challenges". These challenges have worsened since the entry into force of the Lisbon Treaty due to the emergence of two extra players on the scene and new competencies to some of the old players. We hope the Lisbon Treaty was an important step forward (although we sometimes wonder in which direction), but it sure raised quite a few communication challenges to be tackled. This is how ”speaking with one voice” has become a buzzword around Rond-point Schuman (where the Commission and Council HQs are located). As usual with buzzwords, they are (ab)used to an extent that blurs their original meaning. 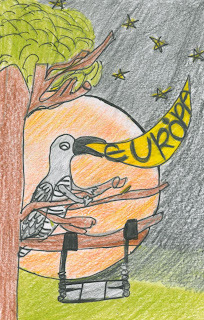 Drawing by Dzsenifer Kovari for the drawing contest "My message to Europe"
Here we try to bring a few examples from our daily communication work and examine whether speaking with one voice is feasible at all and how it effects the substance of policies. Tuesday (29/03) morning at 7 am, following 12 hours of negotiations, the last round of conciliation on the Novel Food regulation ended in failure due to disagreement on food derived from the offspring of cloned animals (there was general agreement on a ban on clones). In our previous post, we gave detailed account of the 12-hour negotiating marathon (see here). The reaction of the Council and the European Parliament has been very predictable: blaming each other (and the Commission) for the failure of negotiations. Of course, the political group of the EP rapporteur (GUE/NGL) has complemented it with its own, though shorter version (see here), claiming that “Council and Commission closed their ears to MEPs and the 77% of Europeans who want a ban on food from cloned animals.” The Parliament added a press conference on the subject, where only MEPs were present. Commissioner Dalli has appeared at the Commission’s midday press conference on the issue, where he took a rather neutral view (see his statement here). He refrained from blaming the collapse of the talks on any of the parties, which was rather elegant, taking into account earlier criticism directed at him. We are wondering, however, if we could have perhaps organized one single press conference where everyone is invited and have the chance to collide arguments? Could we not refer to each other’s opinion in the press releases (minimum option) or even try to publish joint press releases (maximum option)? This would definitely help the image of the Union and the understanding of our decision-making process. The point we are trying to make is that institutions represent different interests and thus have different opinions. This is democratic decision-making, where debate should be welcome. But debate is not the same as the blame-game, which will hurt us all in the long run. It's another great blog post, but I don't agree. Commission, Parliament, and Council are distinct institutions with sometimes distinct interests and citizens should know that. Interest in decision-making and democracy doesn't come from seeing that everyone agrees on what then appears to be decision-making without alternatives but from the fact that one sees that it makes a difference for whom we vote or whose side we support. The fact that citizens can't distinguish Commission, Parliament, and Council is that the media often don't take the time or interest to present the full debate with the different sides when it comes to EU affairs while they would create amazing stories of political conflict for the same policy issues when debated by national political actors. In this regard, this and your previous blog posts are a much better work than most journalists usually employ when talking about EU policies (in particular since there was no result in this case). "We are wondering, however, if we could have perhaps organized one single press conference where everyone is invited and have the chance to collide arguments? Could we not refer to each other’s opinion in the press releases (minimum option) or even try to publish joint press releases (maximum option)?" As Ron above has said, the different institutions represented different interests. (The EU public in the case of the EP, apparently a handful of American farmers in the case of Council!) A press conference is not a forum for a debate and it is in the interests of media and the public to hear the arguments presented clearly. "Without trying to decide who is right and who is wrong..."
Statement: “The discussion failed because of European Parliament's inability to compromise…” + "In the vast majority of those issues it was the Council that accepted the Parliament’s position." Fact: 90% of MEPs in plenary had voted for a ban on food from clones and all descendants of clones. The EP compromise proposed labelling only for first generation offspring, among many other compromises. Please show us the equivalent level of compromise by the Council from its common position. Statement: "There was general agreement on a ban on clones"
Fact: There is no food production from clones, so let's not get into this red herring! Statement: EP proposed "a misleading, unfeasible “solution” that in practice would have required drawing a family tree for each slice of cheese or salami"
Fact: 1st generation labelling hardly needs a family tree! Just data on whether either parent is a clone. So it's a nice soundbite but a wild exaggeration. And all that is without acknowledging that we already need to know a lot about where food comes from under current rules. Statement: "The Council does not want to mislead consumers by agreeing rules that cannot be enforced." Fact: The EP proposal made clear that derogations could be introduced for food products where it could be proved labelling would not be feasible. Statements: "The Council does not want to provoke a trade war" + "Commission's neutral view"
Thanks for an interesting post and a genuine insight into the communication challenges that these scenarios pose. But let's not muddy the waters about talking only about "blame games", without looking at the facts. These are rather big concessions, especially if you consider that no such legislation exists anywhere in the world and no scientific evidence for any food safety concerns. As for labelling: in particular, due to BSE et al., for individual bovine identification the EU has a system in place along with labelling of fresh bovine meat - and that’s exactly why we suggested to introduce the labelling of fresh bovine meat from offspring with a very short delay, because we do have the system in place. In relation to other products, the labelling is more complicated as you need to supply the relevant information along the whole food chain, it means higher costs for the producers and the industry and at the end higher prices for consumers. Also to establish a credible labelling system you need a traceablity system of reproductive materials and live animals which can lead to a labelling. As in any other legislation to establish a system, you need some time and preparation and also an impact assessment, therefore the Council suggested to introduce the labelling for other products as subject to the result of a feasibility study and an impact assessment. On the other hand, the EP proposed to introduce a labelling system for all food from offspring immediately and without due diligence, and later maybe consider some derogations. On top of its sheer impossibility as the producers and the industry would not have had the necessary information to label all food products, this could also end up in a situation where food industry starts to label foodstuff, investing a lot of money in it, and then they get a derogation because it turns out that even with the investment it cannot work. Who would pay for all that investment? You and I. Only to have an unworkable labelling system that we think woudl have caught offspring but in reality not? And instead of the sensible compromise, the EP got rid of the whole thing, eliminating any chances for a future traceability system (if it was difficult now, how difficult will it be in 2 years' time) Thats what I called political grandstanding. And then we have’t talked yet about the official controls, which you need to carry out in order to verify, if the label is true; it does not only mean to read the label but to go back all the food chain (imagine in case of a cheese on a pizza) till the farm to check the documentation. It is also worth to mention that currenty there is not a single commerically used laboratory check for deciding if the food in question is originated from an offspring or contain some ingredients from an offspring. The first question is to decide if the food from offsprings and the food derived from conventionally bred animals are „like” products. If not then according to GATT it is not compatible with the GATT rules to introduce complusory labelling. This was clearly stated in the Council Legal Service opinion as it concluded that all measures under discussion (ban of food from cloned animals, ban of food from offspring of cloned animals, pre-market authorisation procedure for food from offspring of cloned animals) entailed risks as far as their compatibility with the WTO rules is concerned.